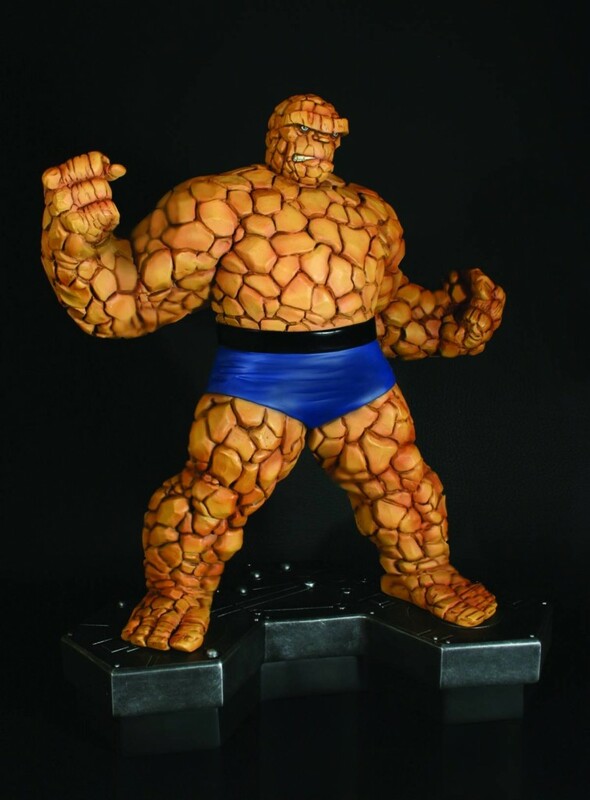 The Thing statue is now available! Ben Grimm, better known as the Ever Lovin’ Blue-eyed Thing — is a founding member of the Fantastic Four. In the Marvel Universe, Reed Richards, Sue Storm, Johnny Storm and Ben Grimm are bombarded by cosmic rays while on an experimental space flight. Each adventurer is transformed, and it is Ben Grimm who becomes the man-monster with incredible strength. The original Fantastic Four comic books can be a little pricey nowadays, but all have been reprinted in beautiful collections by Marvel. Check out the Fantastic Four Omnibus 1 and 2, and also the highly-acclaimed John Byrne Fantastic Four omnibus. The Thing has also starred in his own team-up series — Marvel Two-In-One, as well as his own self-titled comic book, The Thing. The marvelous statue above is sculpted by Randy Bowen and stands 13.5″ tall. The Thing is ready for some knuckle-crackin’ action!